We are thrilled that the governor has taken up the toughest challenge of all: meaningful campaign reform. We believe passionately: Small donor matching funds can give ordinary citizens the loudest voice even in the face of secret money and Super PACs. These remarks were delivered at a lunch event sponsored by the Brennan Center for Justice, the Committee for Economic Development, and NY LEAD, among others. New York — the state we love — once led the nation in government innovation and political reform. Lately, though, it has led the nation in the need for reform. We have too few voters … too little interest … too many special interests. Now after Citizens United, our politics risk being flooded by huge sums of unaccountable money. We can do better. We are here today because we realize we have a chance to do better. I have worked on the issue of money and politics on and off for three decades. Rarely have I seen the opportunity for action that we have in New York, here and now. What accounts for this optimism — this prudent, tempered optimism? There are two new factors. First, the remarkable coalition that has come together for reform. We are proud to have played a role in bringing together New York Leadership for Accountable Government (NY LEAD). Civic, business, philanthropic, and political leaders. A powerful voice to insist that a revitalized political system is good for all of us. We say: If we don’t fix our systems, we won’t solve our problems. And this new force is joining with citizen groups, labor, civil rights, and other communities. It is the most impressive coalition for political reform I have seen. 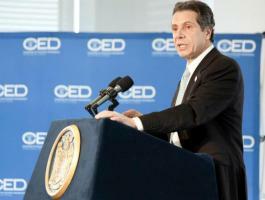 The second reason for hope: The leadership of the Governor of the State of New York. I had the privilege to work with Governor Cuomo for seven years when I was working in the White House and he was HUD secretary. I was struck then — who could not be? — by how focused, how strategic, how effective, and how passionate he was. And we are privileged indeed that he has brought those qualities to the job of reform in New York. This has been a longtime concern of the governor and his special counsel, Jeremy Creelan. They have built a record of change. As Attorney General: Project Sunlight, a groundbreaking source of information about governmental decision making. In his first year in office: a comprehensive ethics reform law. In his second year: executive action to modernize voting, expanding registration online, and at government offices. Tens of thousands now registered, many for the first time. Now we are thrilled that the governor has taken up the toughest challenge of all: meaningful campaign reform. We believe passionately: Small donor matching funds can give ordinary citizens the loudest voice even in the face of secret money and Super PACs. We’re under no illusions this will be easy. You can’t lose money betting against reform. But the whole country is watching New York. I cannot help but point out that the idea of public financing of campaigns was first proposed in this country by a New Yorker — a former governor — Theodore Roosevelt. I say to this governor: We stand with you. We are ready for the fight. And we thank you for your leadership.